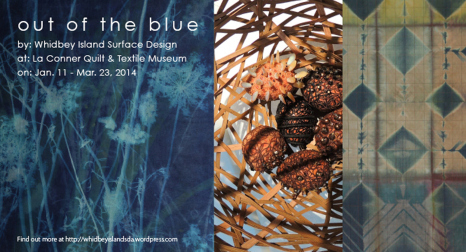 “Out of the Blue” is an exhibition of works in fiber art by artists from the Whidbey Island Surface Design (WISD) at the La Conner Quilt & Textile Museum. Meet the artists and take an artist guided tour of their work at the opening reception on Saturday, January 11, 2014, Reception is from 1:00 to 3:00 pm. Guided Tour from 1:00 to 2:00 pm. Each artist was challenged to literally or figuratively create artwork with Out of the Blue as its theme. At this exhibit you will see contemporary quilts, handmade and hand-dyed textiles, mixed media, wearable art and wall pieces. With 32 members all residing on Whidbey Island, this SDA chapter has been an inspiration to many. Their successful show at the Schack Art Center in Everett was fabulous. You can read more about Whidbey Island SDA and look at profiles of their members on their blog. The show runs from January 11 through March 23, 2014. La Conner Quilt & Textile Museum is located at 703 Second Street, La Conner, WA. Museum hours are Wed-Sun: 11am-5pm, (Mon & Tues by appointment only); Closed major holidays. 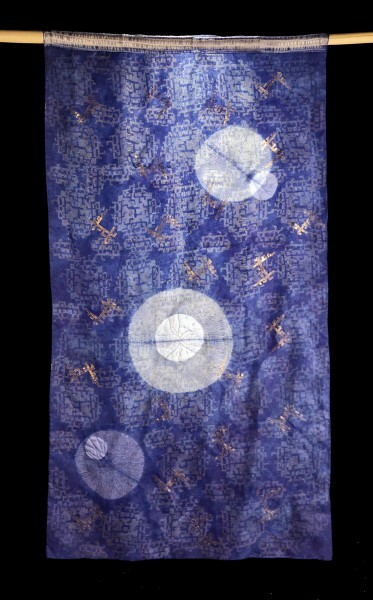 This entry was posted in Exhibition, SDA - Washington and tagged La Conner Quilt and Textile Museum, Out of the Blue, Whidbey Island SDA. ← SDA Eastside Re-Launch Event!